Calling all hockey players, male and female. Have you always dreamed of having wings and flying like an Eagle? Well here is your chance to do so. 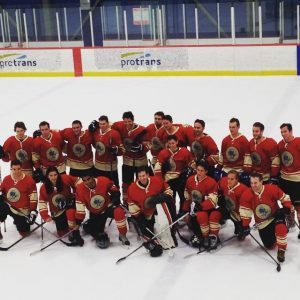 The Legal Eagles are your opportunity to get out there on the ice and play some competitive hockey against other departments and frat houses in Tier 1 league of the UBC Rec Todd Ice Hockey League. There are two seasons, one for first term and one for second term, and they both have their individual playoffs. Unfortunately, the dry spell of winning a championship continues for the Eagles as we suffered two heartbreaking losses in the semi-finals to end our seasons. With that, we could not send our graduating 3Ls last season out with a title. However, I and the rest of the Eagles made a promise that we would get that elusive title in their honour and with a strong and determined core returning, that is the goal along with fun of course! As a 1L last year, I truly can’t say enough how much I enjoyed playing hockey last year and how I couldn’t recommend enough joining us or getting involved with any club or team at Allard. The comradery in the dressing room is amazing and is a great way to unwind from the chaos that is 1L. Further, having a team of all upper years last year provided a great opportunity to learn from them and form connections in an informal setting. I now consider many of them some of my closest friends. We also get involved with the school and legal community itself. We have a couple team nights, likely a school social event this year and are discussing possibly going into a tournament or setting up a tournament with other law schools. Also we played a large Vancouver firm last year and look to play them again this year as well as hopefully some others. Lastly, we are fortunate to have gotten some slick new jerseys thanks to our sponsor Miller Thomson. While our ice times are not the best, just ask our “fans”, as we play LATE at night at Thunderbird stadium, and as a result will mean you’re likely to be exhausted for 9:00 am Contracts class the next day, it is all worth it. So if you are ready to quote our former GM “Fly like an Eagle”, look for us at Clubs day to come sign-up for the team (will likely require tryouts due to numbers) or send me an email if you have any further questions at b44manhas@shaw.ca. Best of luck with 1L, look forward to meeting you all and hope to see many of you out on the ice! Fly Eagles Fly! !